An easy to use Key Presser for Games is described in this post. Whether you need a Key Presser for online or offline game, the Key Presser presented here is equipped with all the features to help you excel or win in your game. Yes you can even use this Key Presser in Full Screen Games which gets installed on your Computer. Depending on the current Game you are playing, you can choose any of the ways / modes in which you wish to use the Key Presser. The Screenshot below displays the main screen of the Key Presser described here. The basic part of the software can be downloaded and installed in a normal application download and installation manner from the Auto Keyboard page. The Key Presser for DirectX or Full Screen Application requires extra efforts and time. The Auto Keyboard as displayed in the screenshot above can be run in either normal mode or as admin. 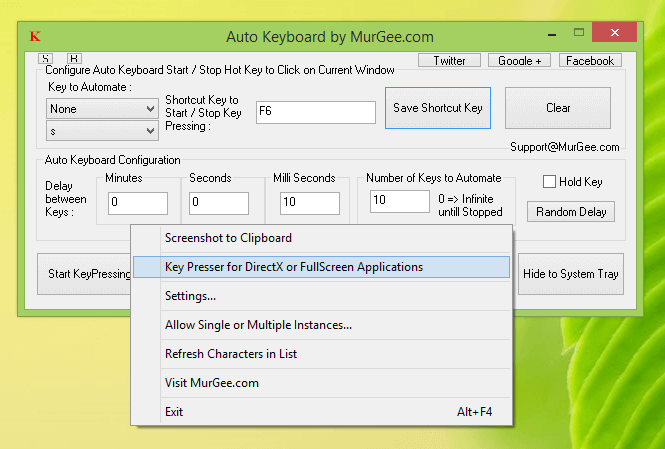 Running the Application as Administrator allows you to Automate Keyboard Keys on all application running on your Windows Computer. 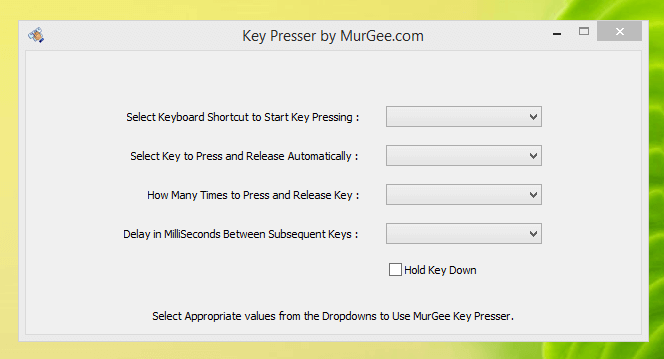 On a basic level, this Application allows you to Automate pressing and releasing of a single keyboard key. The Key Pressing and Releasing can be controlled with a configurable keyboard Shortcut. 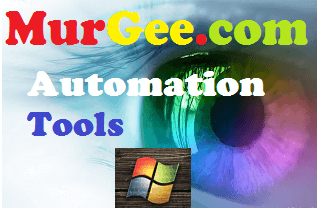 Do download the free trial of this Keyboard Automation Application from the above link and give it a try on your Windows 10, Windows 8.1, Windows 8, Windows 7, Windows Vista or even on your Windows XP Computer. The first time you launch Key Presser for Games, you would be prompted to download & install an additional Windows Device Driver. Yes all the instructions and Video Demonstrations are available to get the additional components installed, so that you can use the Key Presser on any Game irrespective of whether it is a Direct X or Full Screen Game or any kind of Application, the Key Presser for Games work on all kinds of Windows Application and Games. 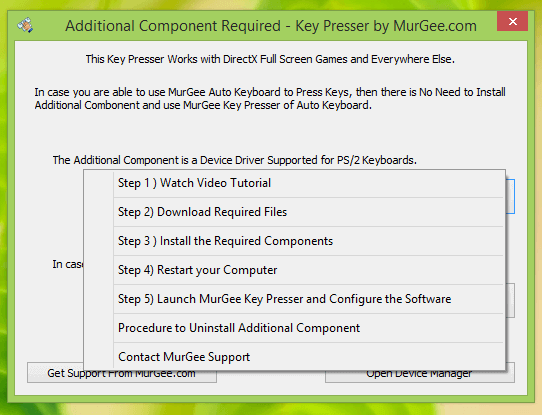 The above Screenshot displays the steps required to install the Key Presser for Games. Note that the first step is to download and watch a Video Demonstration so that you do understand the whole procedure before starting to install the Key Presser for Games. 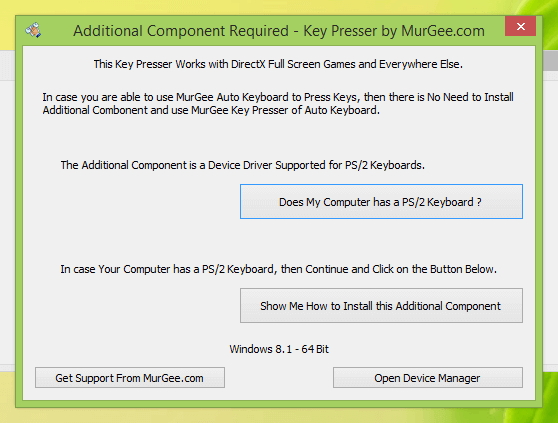 You would need Admin Access to your Windows Computer in order to install the Additional Component required for the Key Presser for Games. The Main Screen of the Key Presser is as displayed in the screenshot below. The Key Presser Screen would be accessible to you once you have installed the extra component as displayed in the screenshot above. Note from the above screenshot that you can select a Keyboard Key to start / stop pressing and releasing of selected keyboard key. Yes you can select the Keyboard Key to be pressed and Released Automatically by the Key Presser for Games. Note that in the next selection, you can select the number of times, you want the Key Presser to press and release selected keyboard key and finally the configurable time delay in milli seconds allow you to control the speed at which the keyboard key is pressed and released. The Best part of this easy to use Key Presser is that it works in all games, all applications and yes everywhere. Download the free trial of the software on your Windows Desktop or Laptop Computer and enjoy all the features of a professional grade software designed specifically for Game Lovers. In case you do not have Admin Access to your Windows Computer, you can still use the basic features of this Key Presser Utility. Installing the Key Presser’s additional components is only a one time task to utilize the Automatic Key Pressing feature of the Key Presser for Games. You might also consider Auto Clicker for Games which provide you Automatic Mouse Clicking functionality apart from Automatic Key Pressing feature. Auto Key Presser and Auto Clicker together can really assist in Games of all kind including MMORPG Games, Online Games, Computer Games and Games of every kind.